Exit at Page Mill Road, make a left onto Page Mill. Follow Page Mill for approximately 2.7 miles and make a left onto Hanover Street. At the stop sign, make a left onto California Avenue. Make a right onto Columbia Street. Make a right onto College Avenue. The Chabad House at Stanford is located at 1289 College Avenue, corner of College and Hanover. Exit at Page Mill Road, make a right onto Page Mill. Follow Page Mill for approximately 2.7 miles and make a left onto Hanover Street. At the stop sign, make a left onto California Avenue. Make a right onto Columbia Street. Make a right onto College Avenue. The Chabad House at Stanford is located at 1289 College Avenue, corner of College and Hanover. Exit at Oregon Expressway (which is the third right turn at the Embarcadero Rd/Oregon Expressway exit). Follow Oregon for about 2 miles. Make a right onto El Camino Real. Make a left onto College Avenue. The Chabad House at Stanford is located at 1289 College Avenue, corner of College and Hanover. Exit at Oregon Expressway (which is the first right turn at the Embarcadero Rd/Oregon Expressway exit). Follow Oregon for about 2 miles. Make a right onto El Camino Real. Make a left onto College Avenue. 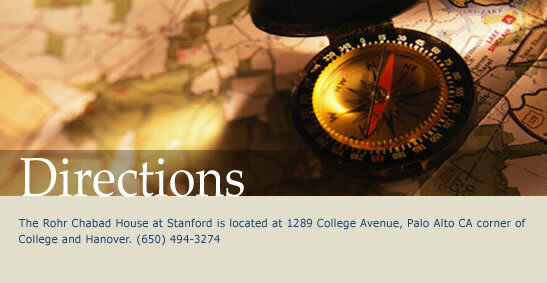 The Chabad House at Stanford is located at 1289 College Avenue, corner of College and Hanover.